1. Charge your damn battery: I was in the middle of a pretty cool broadcast, and people were joining and chatting when suddenly my screen went black, then I saw the Samsung logo and my broadcast was done. I didn’t realize that even though my phone was “charging” the charger wasn’t actually plugged in. 2. Turn Off Location: While I think it’s okay to speak about where you are, the turn on location is WAY too accurate for my liking. On a test ‘scope I had my locations on and when I went to look back, the pin was actually on my house. So that’s a no thank you for me. I have watched one too many episodes of Criminal Minds to ever subscribe to that. 3. Turn on Twitter notifications: This is a simple one, but when you’re getting used to the camera you might forget. And this is the best way to let your followers know you’re live. So click the little birdie and prosper. 4. 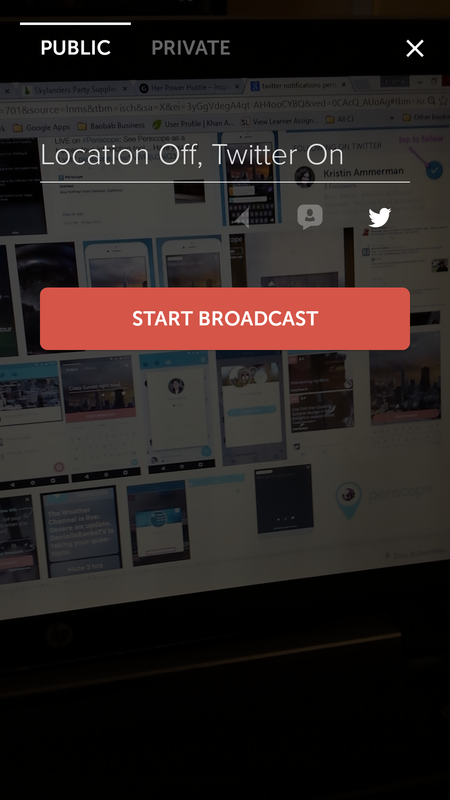 Don’t Bother Tweeting Periscope Co. For help: I’ve been having issues with the replay function, not issues It.Won’t.Work. All I get is audio when people replay, and while the important message is being still being shared, the point is to see the person behind the product. But Michelle of Her Power Hustle, assures me that I’m not the only one with issues. 5. Make sure the Baby is asleep: After doing a little crowd sourcing I found that the women that follow me were interested in a 5 minute challenge on how to relax. Easy enough. I got the kids fed, down and went to my favorite spot in the yard. And just as I was half way through my broadcast my youngest comes out, sits in my lap and reaches to nurse and…Let’s just say nip slips aren’t just for celebs. Thankfully I was quick and could delete the broadcast. I have since re-recorded that video and it was went well. So that’s it, tips from a novice. I am enjoying the communities being built through periscope and think it’s a great tool to promote yourself, your business or just to hang out and learn. For a more in-depth look at periscope check out this article by Michelle Talbert in Black Enterprise, and follow me at Krishna_TheSage.